The Constitution has strangled American democracy for long enough. We need a constituent assembly. "Scene at the Signing of the Constitution of the United States," Howard Chandler Christy (1940). Is it time to call for a constituent assembly in the US? GOP candidates did better in the House, outpolling Democrats by a total of 1.1 percent. But through the miracle of gerrymandering, they managed to translate that slim lead into nearly fifty extra seats — 241 versus the Democrats’ 194. In other words, of America’s four top governing institutions, a minority party was able to take control of one, maintain its grip on a second, grab more than its fair share of a third, and set about seizing a fourth — the Supreme Court — by filling the vacancy created by Antonin Scalia’s mysterious death last February. Americans voted for a centrist party by a significant number, yet are winding up with ultra-right government across the board. What’s going on? The answer is that, after more than two centuries, America’s pre-democratic constitutional machinery is spitting out increasingly undemocratic results with catastrophic consequences. Instead of government of, by, and for the people, it’s giving the people government they don’t want but can do nothing about. The immediate cause of the breakdown is a growing population shift from the agricultural interior to crowded corridors along the coasts. But the more fundamental reason is an ancient constitution that is increasingly at odds with the needs of modern society. In the founders’ day, the ratio between the most and least populous state was twelve to one. Today it’s sixty-seven to one; by 2030, it’s expected to reach eighty-nine to one. As that gap widens, political equality will continue to wither. Because the Electoral College gives states an extra vote for each senator they send to Washington, a state like Wyoming enjoys triple the clout in presidential elections today and, according to census projections, will enjoy quadruple by 2030. Whereas in 1990 it was possible to assemble an Electoral College majority out of states representing 46.15 percent of the total population, today it’s possible to do so out of states representing 45.82. By 2030, the magic number will drop to 44.75. A shift of one or two points may not seem like much over four decades. But as with global warming, minor changes can have major consequences. With an electorate of nearly 140 million people, a candidate could conceivably wrack up a lead three or four times Clinton’s and still not make it into the White House. As politics grow more and more polarized and margins of victory shrink, the chances of yet more Electoral College upsets will skyrocket. Rather than a one-off affair, Trump’s victory is thus a sign of things to come. Politics have collapsed. Congress is gridlocked, the election process is a shambles, and corruption, already out of control thanks to lobbying and campaign contributions, is about to go shooting through the roof as the president-elect merges his political, real-estate, and entertainment empires. The new cabinet is a right-wing horror show of billionaire asset-strippers, mortgage raiders, religious fanatics, and more military brass than in “Seven Days in May.” Authoritarianism is growing more and more overt amid surging racism, anti-semitism, and xenophobia. The entire post-1945 international structure, everything from NATO to the European Union, plus the individual nation-states, is predicated on the vitality of the US constitutional order — a constitutional order now utterly ossified and decrepit. Is a historic upheaval just around the corner? The Constitution is disfigured by innumerable cankers and sores — mechanisms that don’t work, institutions that are out of date, clauses that no one can decipher. But the biggest fault of all is that such problems are unfixable thanks to an amending clause that is even more dysfunctional than the document as a whole. As every civics student knows, Article V says that two-thirds of each house plus three-fourths of the states must concur before any constitutional change can take effect, no matter how minor. In 1790, the three-fourths rule meant that four states representing as little as 10 percent of the population could just say no to any change sought by the remainder. Today it gives thirteen states representing just 4.4 percent of the country the power to do so. As that number falls — it is projected to reach 4.0 over the next dozen years or so — the door to change will shut ever more tightly. The result is a structure whose response to changing circumstances is to grow ever more rigid and unyielding. It is a recipe for a disaster of the sort that is now unfolding before our eyes. Take the Electoral College. Because it triples the clout of the eight smallest states and doubles that of the next six, no one will have any trouble coming up with a list of thirteen states guaranteed to just say no to any deviation from the status quo. Efforts to end-run the problem by urging states to appoint electors who pledge to abide by the popular vote are futile since Republican and swing states can both be counted on to oppose it, the first because it would clearly boost Democratic fortunes and the second because it would mean presidential candidates would lavish less attention on them at election time. The Senate is even more intractable. In 1788, Alexander Hamilton complained that equal state representation “contradicts the fundamental maxim of republican government, which requires that the sense of the majority should prevail.” Today the problem is five or six times worse. A system that gives the two percent of Americans who live in the nine smallest states the same power as the 51 percent who reside in the nine largest doesn’t just undermine the principle of majority rule. It repudiates it ever more decisively. In 1810, thanks to the bedrock principle of equal state representation, it was possible to cobble together a Senate majority out of states representing just 33 percent of the total population. Today candidates can achieve the same thing with states that account for just 17.6 percent of the population. By 2030 that figure will drop to 16.7. 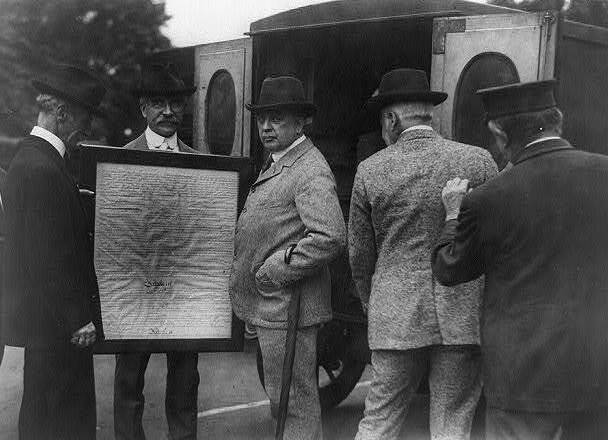 The proportion needed to mount a successful filibuster — i.e. forty-one senators from twenty-one states — will drop to just 11 percent over the same period, meaning that just one person in nine will be in a position to bring government to a halt. Yet nothing can be done thanks to an obscure clause in Article V stipulating that “no state, without its consent, shall be deprived of its equal suffrage in the Senate.” Wyoming (population 586,107) shall therefore enjoy parity with California (population 39.1 million) for as long as it wishes, which, considering the enormous benefits it derives from the current arrangement, is presumably forever. The more America turns into a right-wing hothouse, the more brazen gerrymandering and anti-democratic machinations will become. North Carolina, to cite the most extreme example, hardly qualifies as a democracy anymore. Yet that problem is unfixable as well. The same goes for a host of other constitutional conundrums. Gridlock, for instance. A number of ideas have been advanced about how to put an end to the logjam on Capitol Hill. But none has the slightest chance of running the Article V gauntlet. If America’s constitutional crisis is hard to understand, it’s because no one can quite grasp how an ostensibly sovereign people could paint themselves into a corner in such a manner. Traditionally, Americans have responded by blaming everyone and everything except the document itself. If government is a mess, politicians are corrupt, the prisons are bulging, cops are running riot, and people are being shot down in the street — then it’s because politicians aren’t following the Constitution, they’re misinterpreting it, or else they’re insufficiently patriotic and bipartisan and are looking after their own interests. If Americans would just read it and follow its instructions to the letter, all problems would magically disappear. That was before Trump. Thanks to the Electoral College debacle, some have realized that the country’s age-old plan of government may not be so flawless after all. But since it is apparently unfixable, the reaction is one of depression and paralysis. The people are helpless because while sovereignty supposedly rests with them, it really rests with a yellowing piece of parchment in the National Archives. The idea that Americans have no choice but to stand by as democracy goes down the drain is absurd. Democracy is not some meek and mild creed, but a fierce and jealous god that recognizes no higher authority other than its historical obligation to defend, extend, and deepen its rule. People not only have a right to resist, but a moral duty. But how? By blockading Pennsylvania Avenue, storming Capitol Hill, or kidnapping members of the House Freedom Caucus? Actually, the most revolutionary response is the most peaceful. The people should demand a vote, not on some specific constitutional feature, but on the document as a whole. Before it does any more damage, they should demand a say as to whether it should be allowed to continue strangling democracy. But through what mechanism? This is where the constituent assembly comes in. A constituent assembly has been high on the agenda of the international left ever since May 1789, when Louis XVI convened a body known as the Estates-General in a last-ditch effort to put the monarchy’s finances in order. The Estates was not a constituent assembly. It was an old-fashioned gathering of France’s three traditional orders, which had not met in more than a century and a half and whose members sat separately, voted separately, and even wore separate colors — gold for the nobility, red or violet for the upper clergy, and black for the commoners. But it turned into something very different when the third estate called on the other two to relinquish their privileges and join together to form a single constituent assembly. The proposal contradicted all existing law and procedure, and, once the other two estates acceded, threw France into a constitutional limbo. The revolution was underway. A constituent assembly is thus an extraordinary national gathering called for the purpose not of passing ordinary legislation but of redesigning the state. It is not a US-style constitutional convention, which, according to Article V, can only be held if two-thirds of the states request one and whose recommendations are then subject to the same debilitating three-fourths rule. This leaves room for little but a state-centered affair in which the people are hardly more than bystanders. A constituent assembly, in contrast, arises not out of the states but out of the people. Since it would represent the nation writ large, its members would vote as a whole rather than as part of individual state delegations. Taken to its logical conclusion, the concept implies that the people should vote as a whole as well, not for candidates in separate state or congressional-district contests, but from a single ballot in a single national election, with seats allocated according to each party or slate’s share of the total. Once seated, the members’ remit would be unbounded. They could tinker with a few clauses here or there or throw the entire Constitution out and start from scratch. They could submit their recommendations to a referendum or decide that they had sufficient authority to institute them on their own. Instead of deriving their authority from Article V, they would impose it — on the amending process, on the Constitution, on society. The American republic founded in 1787–88 was unique in that it was established on the basis of a single self-contained document, one that laid down its own reasons for existing — “in order to form a more perfect union, establish justice, insure domestic tranquility” — and then set forth permanent rules governing how it might be changed. Although the Preamble says that “we the people” ordained and established the new constitution, the reality was the opposite: the Constitution established the people as a single entity, gave them the name “Americans,” and then bequeathed them the only politico-legal framework they would ever know. This was the document’s strength and weakness. It has lasted far longer than anyone expected. But now that the minimalist change it permits is proving inadequate, the ties holding it in place are beginning to fray. When they snap, the Constitution won’t sag or collapse in part. The whole thing will go down. Indeed, the very calling of an extra-constitutional body like a constituent assembly would signal that the ancien régime was at an end and that the time had come to construct a new type of government to take its place. Significantly, voting on the Constitution is something Americans have never been allowed to do. While an estimated 160,000 people cast ballots for delegates to state ratifying conventions, that amounted to just one in twenty-five people and mainly consisted of property-owning white males. 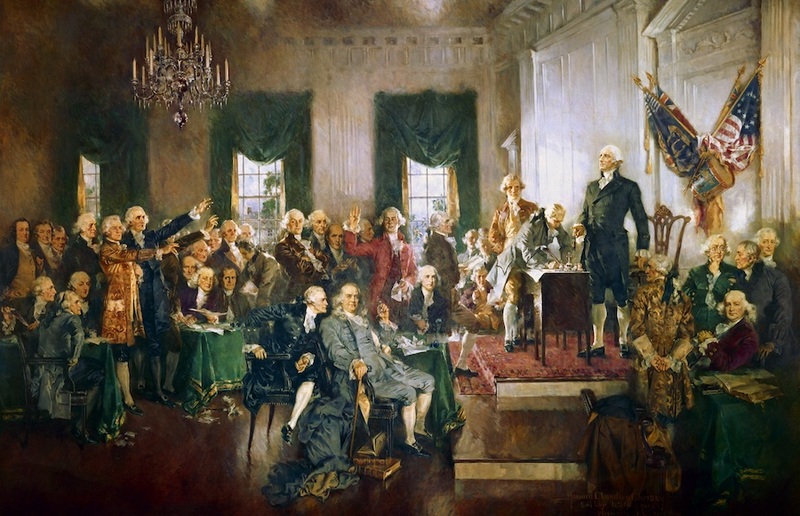 Since then, Americans have only had the opportunity to vote, in a fragmented and indirect manner, for or against individual amendments under the auspices of Article V.
This is the single most undemocratic aspect of American society — its founding flaw so to speak. It’s the equivalent of allowing prison inmates to vote on what to have for dinner rather than whether they should be kept under lock and key. It is why the US is arguably not a democracy at all, but instead an eighteenth-century republic that has taken on certain democratic characteristics while remaining pre-democratic at the core. The goal of a constituent assembly would therefore be to establish the first democratic republic in American history. After the French Revolution, the demand for a constituent assembly figured heavily in the European-wide Revolution of 1848, the Russian revolutions of 1905 and 1917, and the German revolution of 1918–19. Trotsky revived the slogan during the Chinese and Spanish revolutions, and since 2001 it has emerged as a cause célèbre in Latin America. Nonetheless, the concept is controversial among Marxists. One reason is that such bodies have been used against the working class — most notably in France, where a newly formed constituent assembly crushed a workers’ uprising in June 1848 and paved the way for the dictatorship of Napoleon III. Another reason is that the rise of workers’ councils, or soviets, led Lenin, Trotsky, Rosa Luxemburg, and others to conclude that a new system of direct class rule had been born, one more militantly democratic than anything preceding it. 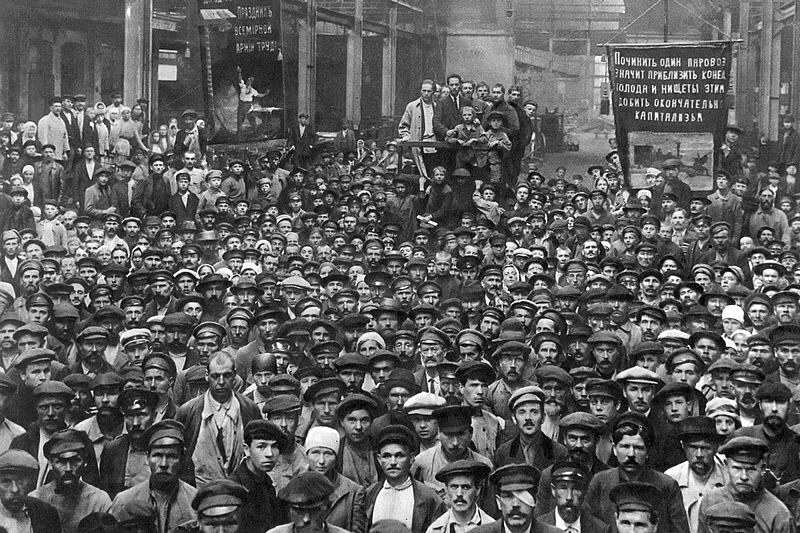 A gathering of factory workers for elections to the Petrograd Soviet. In the name of soviet democracy, the Bolsheviks dispersed a Russian constituent assembly when it met briefly in January 1918, and later that year, revolutionary socialists in Germany assailed right-wing Social Democrats for organizing a constituent assembly to counter the soviet movement springing up across the country. “If we now convene the Constituent Assembly, that would be the death sentence for the workers’ and soldiers’ councils,” Richard Müller, leader of the revolutionary shop stewards’ movement, declared. “The road to the victory of the proletariat can pass only over the corpse of the National [Constituent] Assembly,” the socialist leader Paul Levi told the founding conference of the German Communist Party in December 1919. What is gained, then, with this cowardly detour called the National [Constituent] Assembly? The bourgeoisie’s position is strengthened; the proletariat is weakened and confused by empty illusions; time and energy are dissipated and lost in ‘discussions’ between the wolf and the lamb; in a word, one plays into the hands of all those elements whose intent is to defraud the proletarian revolution of its socialist goals and to emasculate it into a bourgeois democratic revolution. When the choice was no longer democracy per se, but “bourgeois democracy or socialist democracy,” as Luxemburg described it, a constituent assembly was more than a distraction. Instead of urging a halt to class struggle, it was time to see the war through to completion. [T]he National Assembly is going to meet. It will meet and you cannot stop it. For months, it will dominate all political life in Germany. You will not be able to prevent all eyes from being fixed on it, you will not be able to prevent even the best of your supporters from being interested in it, seeking information, forecasting and wanting to know what will happen in the National Assembly. It will be in the consciousness of the German workers, and confronted with this fact, do you want to stay outside and work from outside? As for Lenin, he called for a constituent assembly in 1905 and again in 1917 even while proclaiming “all power to the soviets.” Bolsheviks candidates campaigned for the Constituent Assembly after the October Revolution, and Lenin took it as a point of pride that such a body could convene only once the soviets had ascended to power. If Trotsky could insist on abolishing the senate in France, why can’t socialists do the same in the US? How Advanced Is the US? Still, the idea of a constituent assembly in the US will cause certain socialists to choke on their morning coffee. After all, the United States is not just an advanced capitalist country, but the advanced capitalist country. Wouldn’t convoking a constituent assembly be akin to casting back centuries when we should be moving resolutely forward, toward socialist democracy? The problem is, history does not travel in a straight line. What could be the next revolutionary wave may resemble 1917 in certain respects, but it may also incorporate elements of 1789, 1848, and 1905. As in the past, it will be free to draw from the modern revolutionary tradition as a whole, to mix and match in novel ways, and to add whatever new elements it comes up with. If a constituent assembly becomes part of the revolutionary chemistry, then who are socialists to say no? And besides, how advanced is America really? The agrarian question may be forgotten and slavery may have disappeared. But their imprint lingers in the form of an Electoral College that was expressly designed to boost the power of the slave states and a Senate that was part of a grand bargain giving slaveholders as much as twenty-five extra congressional seats by virtue of the three-fifths clause. The Constitution was an ambiguous achievement even by the standards of the 1700s. The abolition of aristocratic orders, for instance — set forth in Article I, section nine — represented a clear step forward. But whereas Britain was well on its way to concentrating full power in the House of Commons, America’s founders were anti-parliamentarians who sought to rein in a plebeian House of Representatives by offsetting it with a quasi-aristocratic Senate, a semi-monarchical presidency, and a lifetime judiciary. The late conservative political scientist Samuel P. Huntington argued that checks and balances and separation of powers were an attempt to recapture the decentralized “Tudor Constitution” that the Puritans remembered from the days of Good Queen Bess, defender of the Protestant cause, before a new dynasty, the Stuarts, began centralizing English government in 1603. Robert R. Palmer, the great historian of the French Revolution, noted that American ideas about checks and balances and separation of powers were closer to those of the liberal aristocrats leading the charge against Louis XVI prior to 1789 rather than the ardent statists and centralizers who took charge after. That makes the founders the last blast of the old order instead of harbingers of the new. Their creation was a strange agglomeration of the modern and pre-modern, a society that seems zippy and high-tech in certain respects but antique in others. Capitalism is hyper-advanced while labor is locked in a state of Third World underdevelopment. Futurist ideas advance arm-in-arm with the ultra-reactionary. Americans might have tried to sort out the contradictions by subjecting their society to a top-to-bottom democratic overhaul at various points, perhaps during Reconstruction or the 1930s. But such was the Constitution’s mystique that the effort never got off the ground. Besides, a thoroughgoing overhaul requires a sovereign power to see it through. And since the Constitution created US society instead of the other way around, no such independent power exists — only an array of subordinate powers in a state of delicate equipoise. A socialist-minded working class could provide the necessary outside force. By challenging the Constitution head on, it could exert control not only over the political structure but over US society more generally: its class structure, its economy, its external relations, and the runaway oligarchical tendencies that have given rise to a monster like Trump. We are faced, then, with a supreme paradox: a hyper-advanced economy coupled with a pre-modern political structure. Every economic gain validates a worldview in which democracy is narrowed to the vanishing point, politics are stigmatized as innately selfish and corrupt, private enterprise is celebrated as the ultimate good, and America’s right to rule the world is presented as a self-evident truth. The fragmented political system ensures that political disputes will fester for generations, enabling presidents to channel years of accumulated bitterness and strife into expansion abroad. If politics stops at the water’s edge, then foreign adventures can be a means of escaping insoluble political disputes at home. The result is the perfect imperialist state, one that is as aggressive as it is populist. But now that the empire is over-extended and in disarray, Trump seems poised to withdraw America’s forces so he can use them against his enemies at home. Two things seem clear about the coming period. One is that everything is coming under attack: public education, health care, drug decriminalization, the right to vote, the right to strike, and much, much more. The other is that the people most directly in the line of fire are wage earners and the poor. American socialists have been weaned on stirring tales of the great strikes of the 1930s in Minneapolis, Toledo, and San Francisco. For various reasons, those struggles never advanced beyond the trade-union economic stage. In the age of Trump, however, mass strikes will take on a political character from the start. And with the incoming Trump administration shaping up to be the most reactionary in modern American history, then the response will have to be just as radical. 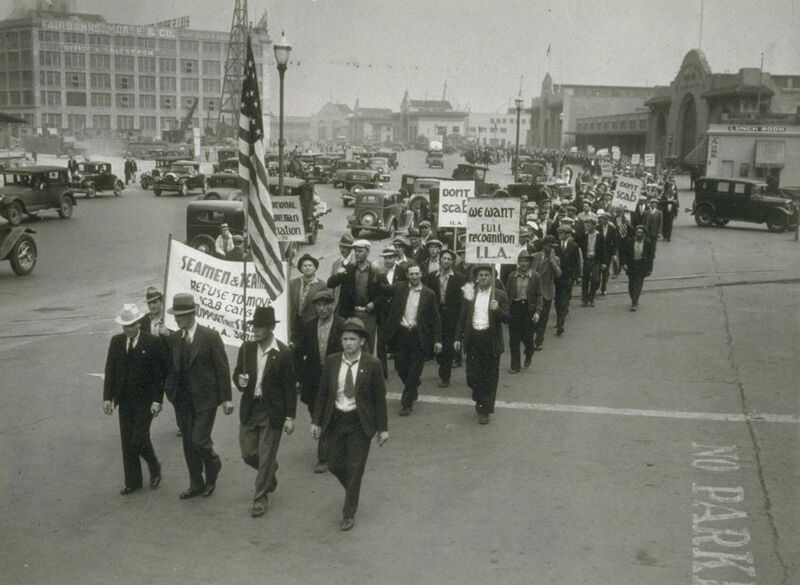 Longshore workers during the 1934 Waterfront Strike in San Francisco. Perhaps today’s staid AFL-CIO bureaucrats will find themselves forced to call a general strike, raising the question of dual power for the first time in US history. If so, calling for abolition of the Electoral College or the Senate would raise the ante even more, while a demand for a constituent assembly would pose the question of the takeover of the state. Rhetoric like this may seem over the top. But the US power structure is far more brittle than generally supposed, and events are moving much more rapidly than anyone would have predicted just a few months ago. As Brexit, the refugee crisis, and spiraling US-China tensions show, the global power structure is also weak. It’s important to keep in mind what’s at stake here. The United States is not a semi-peripheral country like Russia in 1917, but the ruler of history’s first global empire. Since World War II, it has been busily remaking the world in its image as it carefully nurtured neo-federal institutions like NATO, the EU, and the European Court of Justice. While the US empire is first and foremost a military and economic alliance, it’s also a legal construct based on the concept of an untouchable constitution, a reduction of democracy to a few liberal formulas, and judicial review. March the people to the polls, in other words, so they can vote for one of two corporate-controlled candidates, and then march them back home again. Teach them that a two-century-old constitution represents the absolute summit of political thought so they will never be tempted to tamper with the political structure on their own. Tie the people down, Gulliver-style, with innumerable laws and treaties so that capital can be set free. It’s a formula that has only worked as long as the economy continued to grow, wages remained strong, and imperial power was expanding. Now that that is no longer the case, many are beginning to recognize they’ve been residing in a giant prison and must somehow find a way out. Context is all, as Lenin, Trotsky, Luxemburg, and other classic Marxist thinkers observed. Conceivably, some bourgeois visionary might push for a constituent assembly in order to stave off socialism much as centrist-leaning Social Democrats did in Germany in 1918. But a replay of German events seems far-fetched. For more than two centuries, the Constitution has provided US capitalism with the rock-solid legal foundation it’s needed to grow into a world-transforming power. States’ rights, limited government, separation of powers — these are in US capitalism’s bones the same way that Westminster-style parliamentarism was in British capitalism’s bones in the nineteenth century. The ruling class will defend them tooth and nail against the Left even while cheering on Trump as he tramples them on the right. Like it or not — and regardless of the Left’s relative strength — this is the great issue that will dominate US politics in the coming period: capitalism versus socialism, and a degraded bourgeois constitutional tradition versus working-class democracy. It’s not so different from the lineup Luxemburg described in 1918­­–19. Old habits die hard, and leftists still find it easier to protest police brutality in the streets than to organize against the institutional miasma of the US Senate or the Electoral College. But these are the fault lines along which the US power structure is coming undone, and the basis for a potential democratic reconstruction. The Left won’t have a choice but to respond accordingly.